We often hear of the importance of a good mattress, and of course, it’s crucial in getting a good night’s sleep as well as supporting your body properly. But what is it that can really lift your spirits and make you think “I love my bedroom” every time you walk in? 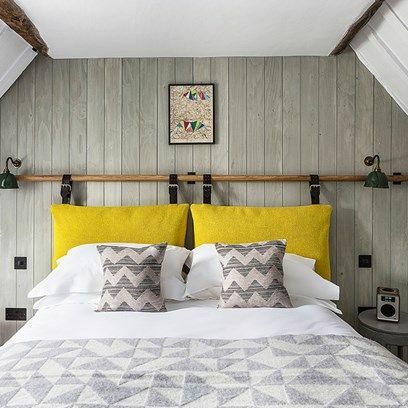 I think a beautiful headboard can give a bed and a bedroom a lift, it gives the bed height and prominence in the room, can add colour without being overpowering as its size is limited and if upholstered, adds a sense of comfort. Lots of people add cushions to the decor to add texture and luxury but realistically, anything more than two cushions is a nuisance as you have to remove them every night before you get into bed, let alone replacing them on the bed in the morning. Let the headboard and two cushions do the job. 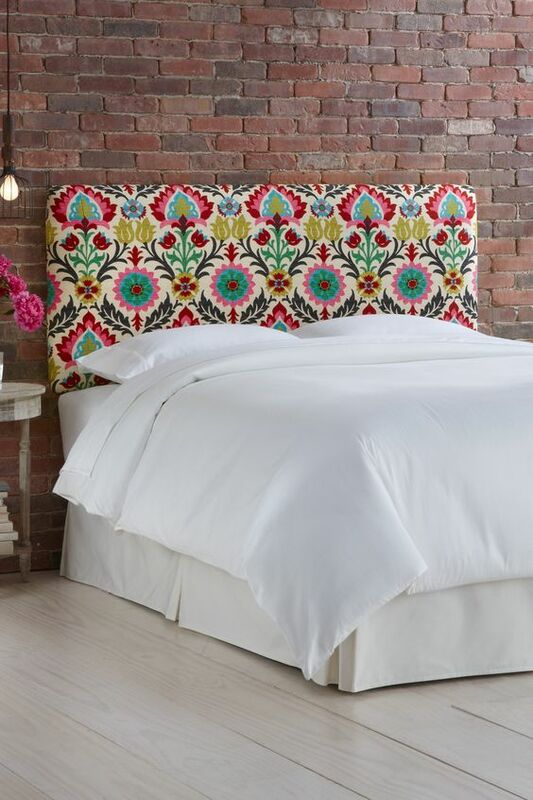 It is headboards like this that really put the word “master” into Master Bedrooms. Its size and deep buttoning makes it elegant, masterful and luxurious. It doesn’t need colour or pattern to create a wow statement. This pale pink upholstered headboard creates just as big an impact but is more feminine and less masterful in its environment. 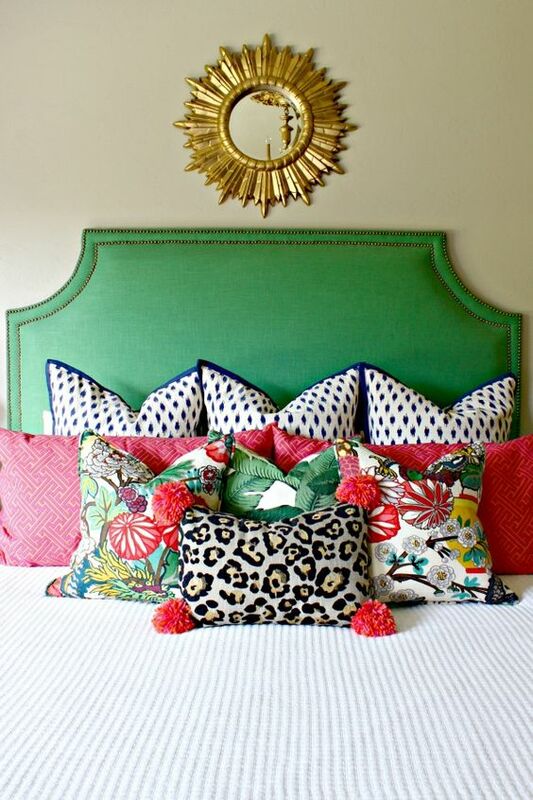 This floral headboard is all the more stunning as everything around it seems to be plain. 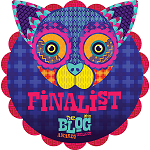 The design really creates an impact – big, bold and colourful. 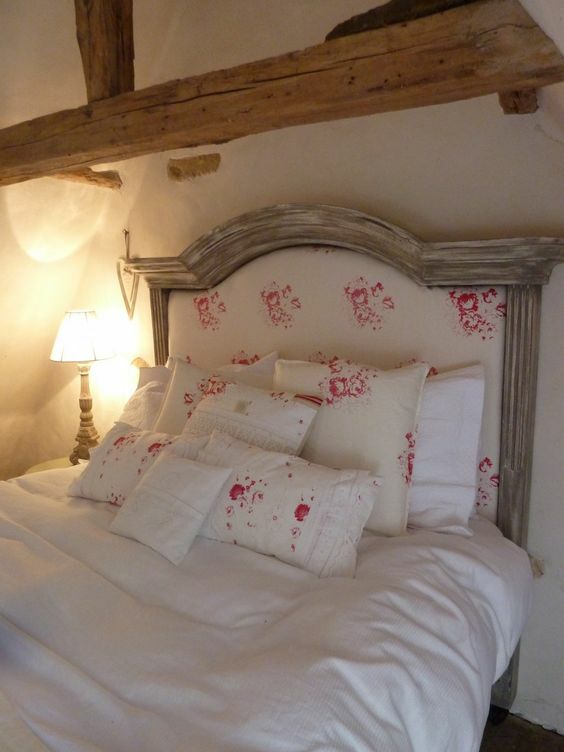 Note that the headboard is sized perfectly for the fabric design, the five flowers on the top row fit perfectly edge to edge as does the design on the middle row. Details like that really matter. Understated yet elegant, this ticking fabric in teal and dark cream finished with a plain edging works perfectly to create a calm country atmosphere. The size and shape connote comfort and simplicity. Beautiful. If you prefer the warmth of florals in a country chic design, this simple floral fabric, finished off with a wooden trim, is lovely. Seeing these large flat cushions hung on a curtain pole brought me back as this is exactly what we did in our first home. All it requires is a curtain pole, two large thick pieces of foam, fabric and a sewing machine. What I particularly like about this idea too is the cushions and fabric can be changed very easily from winter to summer if you wish to do so. Too many cushions for my liking but they are really for display purposes. This headboard is beautifully plain with the detail of the two lines of studs but the vivid green colour that is picked up in accessories is just stunning. 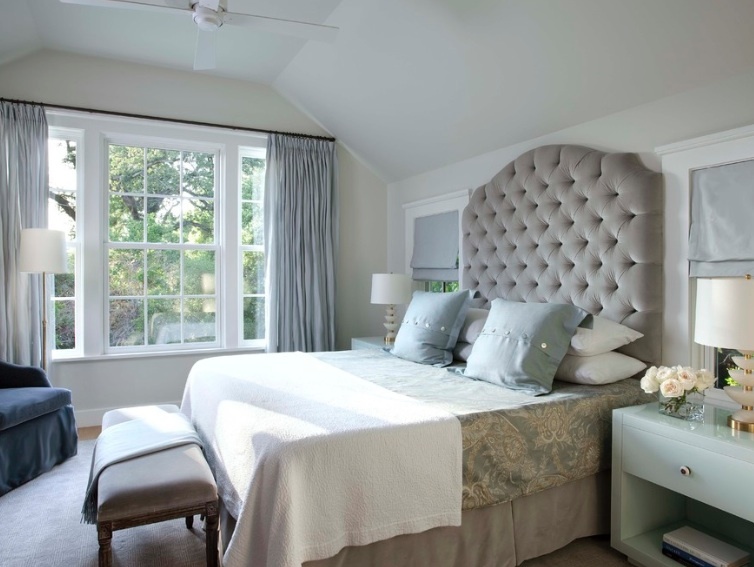 Upholstered headboards don’t always have to be deep buttoned or patterned to take your breath away. 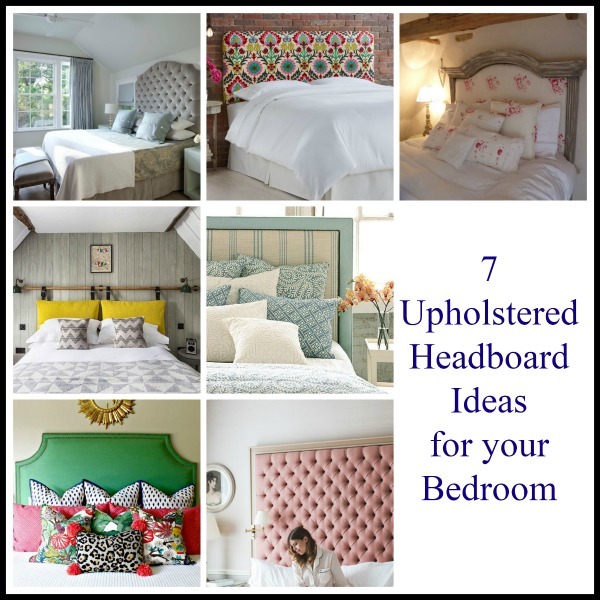 Upholstered headboards, be they floral or plain, checked or striped, deep buttoned or trimmed, definitely add luxury and a wow statement to your bedroom. I hope this selection provides you with inspiration for your own design scheme. 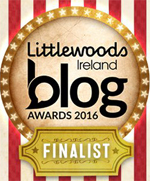 Great post and worthwhile read guys keep up the good work! !